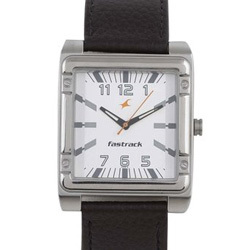 Feel great when you gift this Dashing Titan Fastrack Economy Gents Watch and bring joy into the lives of the people you love. This Gents Watch is crafted with White Colour Dial of Brass material, Square Shaped Case, Black Leather Band with Buckle Clasp. This Gents Quartz has Analog Display, Water Resistant capacity with 9 Months Warranty.